Millions of Australians suffer depression and many of these people receive little relief from treatment like medication. Although the standard treatment for depression is medication intervention, often alongside some form of talking therapy, these options do not work for everyone. In fact, a significant number of people who use antidepressants report unpleasant side effects and others find that there is no change in depression symptoms after taking medication. If you, or someone you care about, continues to suffer from depression and is discovering that medication isn’t having the effect they would like, there are luckily a number of other drug-free depression treatment choices which may make a positive difference. This form of therapy is often the first type of treatment that a person with depression will experience. It is also known as a form of talking therapy. Talking therapies are a good place to commence exploring thoughts and feelings with a professional clinician like a counsellor, psychologist, psychiatrist or psychotherapist. There is a wide range of therapies that are covered under this umbrella including Cognitive Behaviour Therapy and Dialectic Behaviour Therapy. These types of therapies are evidence based and have been proven to be effective in treating depression and bipolar disorder. Your professional medical practitioner is the best person to guide you through the best treatment options for you and your particular condition. Getting involved in therapies that do not focus primarily on talking are always useful in getting mind focused on a task. These therapies are undertaken on their own or can also compliment another form of medical treatment. These therapies can include anything from Horticulture therapy to art therapy, light therapy or dance therapy. The mentor or leader of the group is trained to guide the participants through each session where the process is the focus for the individual and not the skill or end result of the therapy. One of the most innovative drug-free depression treatment choices available is Transcranial Magnetic Stimulation (TMS). This procedure involves the placement of an electromagnetic coil on the scalp. When switched on, the coil sends electromagnetic waves to the part of the brain which controls mood, stimulating the nerves there. Over time, the electromagnetic stimulation aims to “reset” the action of the nerves which affect mood in an effort to improving depressive symptoms. TMS is relatively pain-free, non-invasive and present milder and fewer significant side effects to anti-depressants or ECT. Patients are awake during treatment sessions and do not require sedation for the entire process so they sit and watch television while the treatment is undertaken. Treatment sessions need to occur closely to give it the best chance of success. Besides being documented and approved as a valid treatment for depression which has achieved demonstrable success with a number of patients, there are several other advantages to this method of treatment over others. It can be safely used on a wide range of patients, including those with pre-existing medical conditions or those on medication or in frail health. Patients do not have to discontinue anti-depressant use in order to try TMS – it can be used as an additional treatment alongside medication. TMS can be used by people with limited mobility and even those who are bed-bound. With minimal side effects as a result of treatment, TMS is considered a very low-risk, easily tolerated treatment. 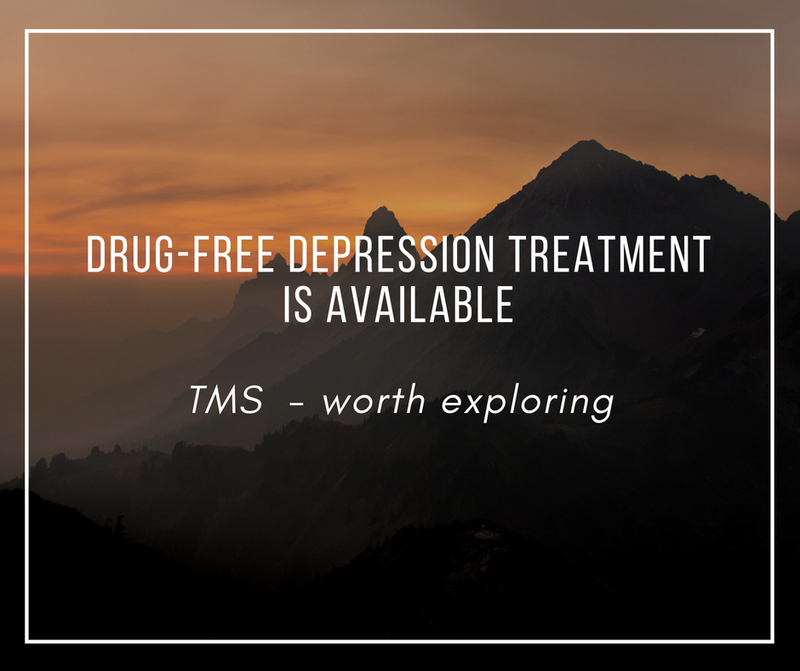 If you are looking for drug-free depression treatment that is safe, widely tolerated and suitable for almost anybody, then TMS could be the right option for you. For information about whether you are suited to TMS treatment please read here if it is for you. Your nearest Sydney TMS practitioner will be able to advise on the suitability of the treatment for your individual circumstances.